I love her books and I am truly grateful that she has shared her knowledge with the world. When I apply these principles, great things happen and continue to happen. It's when I stop applying them or forget to apply them because of old habits that the "shine" in life begins to fade. 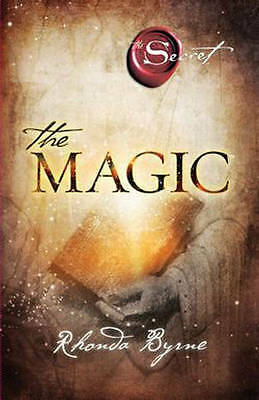 In The Magic a great mystery from a sacred text is revealed, and with this kwledge Rhonda Byrne takes the reader on a life-changing journey for 28 days. Step by step, day-by-day, secret teachings, revelations, and scientific law are brought together to form 28 simple practices that open the reader's eyes to a new world, and lead them to a dream life. Rhonda began her journey with The Secret film, viewed by millions across the planet. She followed with The Secret book, a global bestseller, available in 50 languages and with over 25 million copies in print worldwide. The Secret has remained on the New York Times bestseller list for over 200 weeks and counting, and was named by USA Today as one of the top 20 bestselling books of the past 15 years. She continued her groundbreaking work with The Power in 2010 and The Magic in 2012, also New York Times bestsellers. item 2 The Magic by Rhonda Byrne. -The Magic by Rhonda Byrne. item 7 The Magic by Byrne New 9781849838399 Fast Free Shipping.. -The Magic by Byrne New 9781849838399 Fast Free Shipping..
Easy to read an apply daily. I love this book. It's thought provoking and turns you mind to the positive and everything we already have to be grateful for.